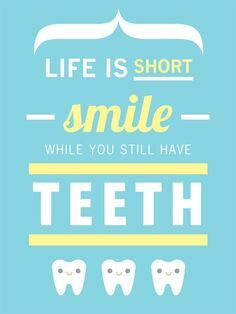 Quotes are an easy way to motivate your patients to practice good oral hygiene and preserve their natural teeth and gum. Therefore, every dentist should have a few quotes about oral health displayed on their office walls. If you are looking for some inspiration, we have created a list of 60+ ideas below for your to choose from. A dentist at work in his vocation always looks down in the mouth. ~ Richard Baxter Quotes, Poetical Fragments. Happiness is your dentist telling you it won’t hurt and then having him catch his hand in the drill. If a patient cannot clean his teeth, no dentist can clean them for him. Some tortures are physical and some are mental, but the one that is both is dental. You don’t have to floss all your teeth – just the ones you want to keep. ~ Miguel de Cervantes Quotes, Don Quixote, 1605. Smiles are contagious so go forth and contaminate as many people as you can! Life is Short. Smile, while you still have teeth. You’re never fully dresses without a smile. A smile takes but a moment, but the memories of it last forever. Keep calm and put a smile on. Smile, it raises your face value. Two minutes. Two times a day. Stick by these two simple rules for a healthier smile! 4 minutes a day is all it takes! Remember, Dentistry is NOT expensive – Neglect is! The toothbrush doesn’t remove 6 months of tartar, 30 minutes before your appointment. Your teeth ain’t gonna brush themselves! Don’t choose favorites… every tooth deserves to be flossed. With great power comes great responsibility. Use your toothbrush wisely! Be kind to your dentist. Because he has “fillings” too. Dentists – Improving lives, one smile at a time! Dental hygienist – sweet enough to make you smile, skilled enough to protect it! A dentist gets to the root of the problem.